Scientifically, this is mostly virgin ground. 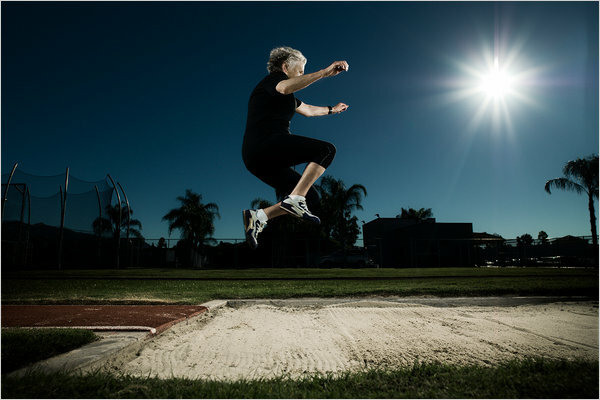 The cohort of people 85 and older — the fastest-growing segment of the population, as it happens — is increasingly being studied for longevity clues. But so far the focus has mostly been on their lives: the foods they eat, the air they breathe, the social networks they maintain and, in a few recently published studies, their genomes. Data on the long-term effects of exercise is only just starting to trickle in, as the children of the fitness revolution of the ’70s grow old. Though the world of masters track offers a compelling research pool, Taivassalo may seem like an unlikely scientist to be involved. Her area of expertise is mitochondrial research; she examines what happens to the body when mitochondria, the cell’s power plants, are faulty. Her subjects are typically young people who come into the lab with neuromuscular disorders that are only going to get worse. (Because muscle cells require so much energy, they’re hit hard when mitochondria go down.) Some researchers now see aging itself as a kind of mitochondrial disease. Defective mitochondria appear as we get older, and these researchers say that they rob us of endurance, strength and function. There’s evidence that for young patients with mitochondrial disease, exercise is a potent tool, slowing the symptoms. If that’s true, then exercise could also potentially be a kind of elixir of youth, combating the ravages of aging far more than we thought. 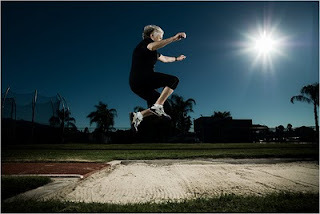 Be sure to read the entire article and learn about Olga Kotelko, a 91 year old athlete who can run the 100 meter dash in 23.95 seconds -- which is faster than what's currently being run in the 80 year old classifications. You go, girl. Happy to see that someone has picked up on my recommended course of action following the failure of last year's climate change conference at Copenhagen: The American Spectator: "UN 'Permanent Emergency Session' Sought for Kyoto." Are new ideas and new inventions inevitable? Are they driven by us or by a larger force of nature? In this conversation recorded as part of the New York Public Library series LIVE from the NYPL, Steven Johnson (author of Where Good Ideas Come From) and Kevin Kelly (author of What Technology Wants) try to convince Robert that the things we make—from spoons to microwaves to computers—are an extension of the same evolutionary processes that made us. And we may need to adapt to the idea that our technology could someday truly have a mind of its own. Enhancements of human capacities, such as an increased lifespan or improved cognitive abilities, are a source of significant controversy. Some see them as a welcome development; others are much more skeptical. What is the realistic potential of enhancements? What are the ethical limits, if any, on enhancements? How should they be regulated? Speakers include Art Caplan, Allen Buchanan and many others. The event, which will be held at the University of Pennsylvania in Philadelphia from December 3-4, is also sponsored by the Penn Center for Bioethics and the Penn Center for Neuroscience & Society. I will be there along with my colleagues from the Institute for Ethics and Emerging Technologies. We'll be sure to represent. Didn't William Gibson predict this? [O]ur society is made possible by the relatively short timescale of our lives. Extending our life spans a little is merely problematic. Extending them a lot demands a whole new paradigm. Otherwise, our future will be ugly and tedious, punctuated only by video games, dental appointments, and the occasional boorish lout. Seth Shostak, the senior astronomer at SETI, applies two primary objections to radical life extension: (1) extreme risk aversion on account of indefinite lifespans and (2) the problem of boredom and ennui. To the first point, one could make the case that, given the current fragility and tenuousness of our mortal lives, we will be no less risk averse in a future where death is dramatically less common. Moreover, death from accidents in the future will be significantly reduced on account other developments, such as self-driving cars and suspended animation surgeries. To his second point, Mark Walker has answered the boredom and ennui complaint better than I ever could. But suffice to say that different people are going to respond differently to superlongevity, and that boredom and ennui will soon be treated as vestigial psychological states that will be self-regulated it if not eliminated altogether. Makes me wonder what Seth Shostak imagines advanced extraterrestrials to be like. His must be a very small ET. 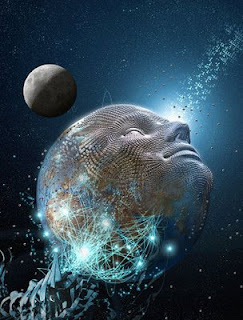 Check out this excellent Philosophy Bites podcast featuring David Chalmers who is asked about the technological singularity, whole brain emulation, uploads, and the possibility that the Universe is a kind of simulation. A handful of neuromarketing firms, like EmSense, Sands Research, MindLab International and NeuroSense, now specialize in the latest mind-mining techniques — EEGs, M.R.I.’s, eye-tracking — or in older biometric methods that track skin, muscle or facial responses to products or ads. Companies like Google, CBS, Disney, Frito-Lay and A&E Television, as well as some political campaigns, have used neuromarketing to test consumer impressions. And, in 2008, Nielsen invested in NeuroFocus, the largest of these firms, adding credibility to the field. Onion: Are we giving robots too much power? Inner ear changes could allow people to escape motion sickness...[You could have genes for] bone regeneration, DNA repair from radiation, a strong immune system, small stature, high energy utilization, a low risk of genetic disease, smell receptors, a lack of hair, slow skin turnover, dental decay and so on. 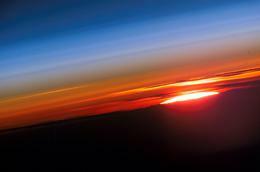 If people are traveling in space for their whole lives, they may want to engineer genetic traits for other purposes. Human engineering is one of those things we all agree that you can’t do, because you can’t do human experimentation. Making that leap from genetic selection to genetic engineering will be a very complex one for society to make – if it ever does. I don’t think doing it in space makes it any easier. 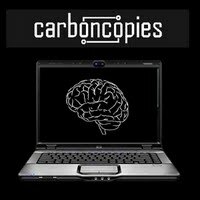 Carboncopies: "Realistic routes to substrate independent minds"
Check these guys out: Carboncopies. Operating under the tagline, "Realistic routes to substrate independent minds," they are a nonprofit organisation with the goal of creating a networking and outreach community around the central idea of Advancing Substrate Independent Minds (ASIM). This is a field of research which seeks to "understand the brain and nervous system of a wide range of organisms, including humans, in order to facilitate emulation of these organisms in an artificial substrate, for example a computer processor." 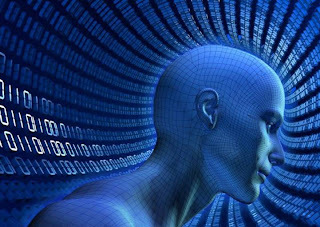 Nanotechnology, biotechnology, brain imaging, neuroscience, artificial intelligence, computational hardware and architectures, cognitive psychology and philosophy. ASIM sits at the confluence of many subjects, and cross-disciplinary research is a necessity. However, it can be difficult to manage and organise ideas from many different fields of expertise. ASIM offers tantalizing possibilities, but they need to be understood and pursued in a structured fashion. Carboncopies will help by offering a networking platform and hub around which experts in the individual fields relevant to ASIM can gather and exchange ideas. It will also promote these ideas and explain the motivation behind ASIM to a wider audience. To this end, Carboncopies organises workshops and conferences where interested parties can exchange ideas, network with others, and keep updated on the latest developments in the field. They're also gather up-to-date literature and news relevant to the ASIM community. 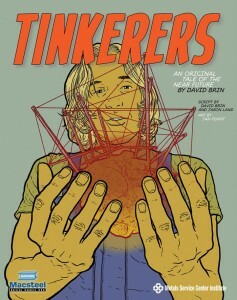 Science fiction writer and occasional Sentient Developments blogger David Brin has released a graphic novel titled "Tinkerers." Set in the year 2024, it is "an original tale of the near future" that combines art with history and tech to explore how the United States lost its way. The story opens with the question: "Imagine a nation that has lost its ability and desire to make things..."
The entire graphic novel is available here. Metal Miner offers its review. 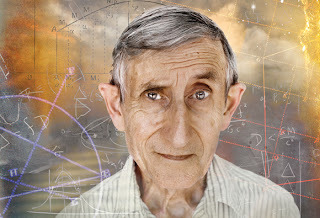 Kenneth Brower of The Atlantic has penned a piece about the life and work of physicist Freeman Dyson, "The Danger of Cosmic Genius." In the range of his genius, Freeman Dyson is heir to Einstein—a visionary who has reshaped thinking in fields from math to astrophysics to medicine, and who has conceived nuclear-propelled spaceships designed to transport human colonists to distant planets. And yet on the matter of global warming he is, as an outspoken skeptic, dead wrong: wrong on the facts, wrong on the science. How could someone as smart as Dyson be so dumb about the environment? The answer lies in his almost religious faith in the power of man and science to bring nature to heel. 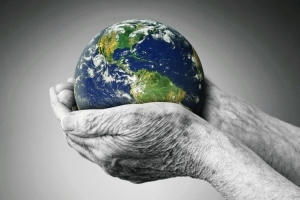 “Environmentalism has replaced socialism as the leading secular religion,” Dyson complains in his 2008 New York Review of Books essay on global warming. This is far too gloomy an assessment. The secular sect on the rise at the moment is Dyson’s own. A 2009 Pew poll found that only 57 percent of Americans believe there is solid evidence that the world is getting warmer, down 20 points from three years before. In response to climate change, we have seen a proliferation of proposals for geo-engineering solutions that are Dysonesque in scale and improbability: a plan to sow the oceans with iron to trigger plankton blooms, which would absorb carbon dioxide, die, and settle to the sea floor. A plan to send a trillion mirrors into orbit to deflect incoming sunlight. A plan to launch a fleet of robotic ships to whip up sea spray and whiten the clouds. A plan to mimic the planet-cooling sulfur-dioxide miasmas of explosive volcanoes, either by an artillery barrage of sulfur-dioxide aerosol rounds fired into the stratosphere or by high-altitude blimps hauling up 18-mile hoses. None of these projects will happen, fortunately. They promise side effects, backfirings, and unintended consequences on a scale unknown in history, and we lack the financial and political wherewithal, and the international comity, to accomplish them anyway. What is disquieting is not their likelihood, but what they reveal about the persistence of belief in the technological fix. The notion that science will save us is the chimera that allows the present generation to consume all the resources it wants, as if no generations will follow. It is the sedative that allows civilization to march so steadfastly toward environmental catastrophe. It forestalls the real solution, which will be in the hard, nontechnical work of changing human behavior. What the secular faith of Dysonism offers is, first, a hypertrophied version of the technological fix, and second, the fantasy that, should the fix fail, we have someplace else to go. Interesting article about polyphasic sleep over at the Zeology blog. Polyphasic sleep is the practice of sleeping (or napping) multiple times during a 24 hour period instead of getting all required sleep at once (monophasic). 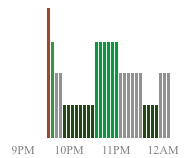 Zeology recently discovered a fascinating post on the "Polyphasic Sleep" Google Group and had the author, Oki, produce a guest post: Sleeping ’round the Clock: A Polyphasic Experiment. Of interest to the Zeology blog and qualitative self gurus, Oki used Zeo to transition to a polyphasic sleep pattern and track data. Took very little adaption. The only tricky part was training myself to go to bed between 8 and 10pm instead of midnight but that only took a few days to get used to. Bare in mind that I’ve been experimenting with polyphasic for the past 2 years so napping comes pretty easy to me. Easy to pop in and out of. I have the old problem of a partner who I sleep with fairly regularly. If I join her for the morning nap there isn’t much of a problem because I just try to time my wake up to be similar to hers. If we go to bed for the evening nap, however, it’s a bit awkward and annoying for me to be woken and get active in the middle of the night while she is trying to sleep. For one, I’m a much heavier sleeper than she is. We’ve tried a bunch of things over the past couple years and it just doesn’t work. Cuddling is important to a relationship That’s ok! If I sleep monophasically once or twice a week it doesn’t mess up my schedule at all! I still usually hit the mid-day power nap if this happens. Also, if work or a social engagement absolutely can’t be avoided or worked around at that time I can still do it and just sleep monophasically when I finally get to bed. I really need to get an extra power nap in there before I do whatever is going to keep me out late, however, or I’ll start getting really sleepy by 10pm. Don’t have a hard time doing any normal activity at night including computer work or reading. No apparent decrease in athletic ability. I’m still able to do vigorous exercise for hours at a time. I'd be curious to know if any of my readers have tried a polyphasic cycle and whether or not it worked for them. My intuition tells me that monophasic sleep, as an evolved sleep mode, is probably best for us, but I'm open to the possibility that it could work. We faculty members with deep concerns for animal welfare are often viewed by our groupthink scientific colleagues as untrustworthy or even treasonous agents provocateurs, since we are inclined to raise both ethical and scientific objections to invasive and lethal animal experimentation, especially when it involves primates and companion animals—that is, dogs and cats. Meanwhile, our animal-rights associates suspect us of insufficient ardor for animal welfare, since we acknowledge that not all research involving animals is torture, and many of us do not object when transgenic mice are painlessly euthanized after being well cared for during their short lives. Groupthink among animal advocates, unless it leads to violence, is harmless enough, but it's self-defeating when the goal is to rally public opposition to vivisection (a term that encompasses both the dissection of living animals for teaching, and performing invasive, intentionally mutilating or maiming surgeries on living animals as a way to do research). A huge reservoir of empathy for our fellow primates and for companion animals goes untapped when PETA demonstrators protest biomedical research on mice or trivia like presidential fly swatting. It may well be that a Gandhi-like respect for all animal life represents the ultimate in human ethical evolution, but until that "consummation devoutly to be wished" is realized, apes and monkeys and dogs and cats are being confined, vivisected, and killed while animal advocates are ignored as a lunatic fringe. One especially disturbing example of primate vivisection repeatedly approved by many university animal-care-and-use committees is a decades-long series of highly invasive experiments performed on rhesus monkeys to learn more about the neuronal circuitry of visual tracking in the brain. The luckless monkeys undergo multiple surgeries to have coils implanted in both eyes; holes drilled in their skulls to allow researchers to selectively destroy some parts of their brains and put recording electrodes in others; and head-immobilization surgeries in which screws, bolts, and plates are directly attached to their skulls. The monkeys are anesthetized during these surgeries. After a recovery period, they are intentionally dehydrated to produce a water-deprivation "work ethic" so that they will visually track moving objects for the reward of a sip of water. First impressions are usually correct in questions of cruelty to animals, and most of us cannot bear to even look at pictures of these monkeys, with their electrode-implanted brains and bolted heads, being put through their paces in a desperate attempt to get a life-sustaining sip of water. Such treatment is justified in the corresponding grant application by invoking the possibility that the resulting data may allow us to find the cause and cure for human diseases such as Alzheimer's. But those of us who have spent decades in research on Alzheimer's disease recognize that such a justification is an ethical bait and switch, since the neural pathway being investigated in these experiments is not even involved in Alzheimer's disease. These experiments in the basic neuroscience of visual tracking are so thoroughly unrelated to the neuropathology of Alzheimer's disease that in more than 28 years of research in the neuroscience of the disease, I have never come across a single reference to them in any scientific literature on neurodegenerative disease. Since most invasive monkey research is not directly linked to alleviating human suffering, argues Hansen, what is the real motivation of scientists doing such things to our cousin primates? "The investigators are not sadists, although they may seem to be from the monkey's point of view," he writes, "Researchers simply see themselves as doing neuroscience, reasoning that if you want to learn about how brains are wired, the easiest and most direct way is to selectively damage a living brain and see what happens." All these efforts reflect a growing awareness that neuroscientists wedded to primate vivisection as a way to conduct research are simply too biased by their own training, research agendas, and career considerations to objectively perform the kind of ethical cost-benefit analysis required before permitting primate vivisection. The trend toward outside supervision of animal vivisection parallels the point made by Georges Clemenceau, a French statesman and physician, who said, "War is too important to be left to the generals." 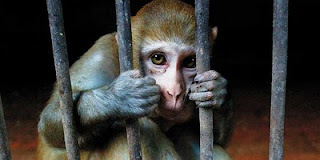 Ethically aware citizens are increasingly concluding that primate vivisection is too important to be left to the researchers who dominate their university animal-care-and-use committees. The Singularity came from the ideas of science-fiction writer Vernor Vinge. It's like the Borg in "Star Trek": something that is a combination of living creature and machine. Followers of the Singularity believe the machine will become more and more intelligent, and that this new creature will be the next step. Homo sapiens will either be subjugated or wiped out. Frankly, I think the time scales are unrealistic. There is no doubt that technology is going to be used to enhance human beings. We've been doing this for a long time. You could say that the dog enhanced human ability; we created dogs from the wolf and used them for our benefit. 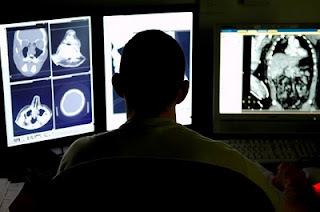 In the modern sense, we use technology inside our bodies. But technology always jumps in a different direction than you might expect. The people who talk about the Singularity look at computer technology and medical technology that puts stuff in our bodies and assume the technology will continue to progress in the exact same direction. I think we're much more likely to end up with technology that interacts with us rather than becoming a part of us. The Singularity is a rather crude idea, and the 2040 prediction is ridiculous, especially if you look at how little cybertechnology has actually developed. Ray Kurzeil has this idea of wanting to live forever, and hoped to keep himself going until the technology developed, so the Singularity is a kind of wish fulfillment. Most of the scientific community, frankly, views him as an eccentric. He gives himself blood transfusions and eats vast numbers of supplements every day, and these are things that actually have very little scientific basis for prolonging life. The Singularity is popular because everyone wants to live forever. It's a very appealing idea. Once again the cult of Ray Kurzweil is invoked, and as is frustratingly typical of these outside commentaries, transhumanism is conflated with the singularity (not to mention the use of ad hominen to dismiss Ray's predictions). 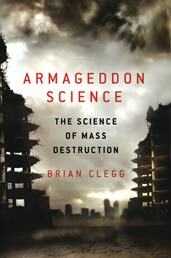 Nowhere in this analysis does Clegg discuss the potential for a runaway superintelligence or an "intelligence explosion" outside of human enhancement. So needless to say, his assessment of the singularity risk is grossly understated. “I’ve learned over the years that the best predictor for what will be new and exciting is, ‘Expect the unexpected,’ ” said Dr. Joseph L. Goldstein, a Nobel laureate who is professor and chairman of the department of medical genetics at the University of Texas Southwestern Medical Center in Dallas. But even if it’s impossible to predict a particular major discovery, one can sometimes sense when a particular area of science is taking off, says Dr. Richard Klausner, a former head of the National Cancer Institute who is now a managing partner in the Column Group, a venture capital firm. “It gets on a Moore’s Law curve,” he said, referring to an observation in computer science that the speed of computing keeps increasing exponentially. When that happens, Dr. Klausner said, “barriers and unknowns seem to be falling,” and it is pretty much predictable that even more exciting discoveries will be made. Biocentric theory: Does quantum physics imply immortality? 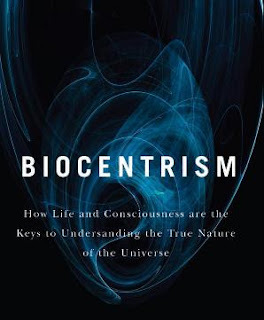 Cool book by Robert Lanza and Rob Berman: Biocentrism: How Life and Consciousness are the Keys to Understanding the True Nature of the Universe. Those unfamiliar with Lanza's particular take on biocentric theory should read this, but he essentially suggests that the Universe is a consequence and construct of conscious observers and not the other way around; it's the quantum realm and the subjective perception of time that "creates" a comprehensible Universe to dwell in. Consequently, argues Lanza, there may be a link to cosmological immortality. Critics claim that this behavior is limited to the quantum world. But this "two-world" view (that is, the view that there is one set of laws for quantum objects and another for the rest of the universe, including us) has no basis in reason and is being challenged in labs around the world. Last year, researchers published a study in Nature suggesting that quantum behavior extends into the everyday realm. Pairs of ions were coaxed to entangle, and then their properties remained bound together when separated by large distances ("spooky action at a distance," as Einstein put it) as if there were no time or space. And in 2005, KHCO3 crystals exhibited entanglement ridges half an inch high, demonstrating that quantum behavior could nudge into the ordinary world of human-scale objects. Probably more metaphysics than physics at this point, but interesting food for thought. I've always been fascinated by theories and philosophical systems that start from the presence of the observer—perspectives like Buddhism and even fine tuning arguments. Indeed, as Buddhism suggests, the most important phenomenon in the Universe is subjective awareness: if nothing is observed there is nothing. Flame away, commenters, flame away. The idea of a single general-purpose "computation" device is fading into the same historical background as having a single steam engine to power a whole factory, or a single electric motor to power every appliance in a house. As it fades, designers and developers have to learn to design smart things that serve the interests, abilities, and needs of people. We must create a practice of ubiquitous computing user experience design. David Kaufman of the Genetics and Public Policy Center in Washington DC quizzed 1048 customers who had ordered genome scans from Decode Genetics of Reykjavik, Iceland, 23andMe of Mountain View, California, or Navigenics, based in Foster City, California. Asked about changes in their behaviour between two and six months after receiving the results, 34 per cent of respondents said they were being more careful about their diet, 14 per cent said they were doing more exercise, and 16 per cent had changed their medications or dietary supplements. "I was surprised at the number of people who said they'd made changes already," says Kaufman, who revealed the results this week at the annual meeting of the American Society of Human Genetics (ASHG) in Washington DC. That's impressive because getting people to adopt more healthy lifestyles is notoriously difficult – even when family history shows a high risk of conditions like type 2 diabetes and heart attacks. There's obviously a selectional effect at play here. People who have gone about personalized genomics are already primed to act on that data, otherwise they wouldn't have gone about it in the first place. A bigger question would be: How would a random sampling of individuals respond to the acquisition of personal genomic data and a listing of their potential risks? My guess is that the figure would be a bit lower than that of the early adopters used in the study. Denial can be a pretty powerful de-motivational factor; people in the pre-contemplative phase of behavior change overtly ignore or dismiss information, even when it's overwhelmingly evident that their lifestyle choices have to change. That said, these results are very encouraging; it points to a future in which behavior modification can be facilitated through the dissemination of highly personalized genetic information. My main point was that two popular anthropic reasoning principles, the Self Indication Assumption (SIA) and the Self Sampling Assumption (SSA), as well as Full Non-indexical Conditioning (FNC) basically agree that future filter steps will be larger than we otherwise think, including the many future filter steps that are existential risks. And be sure to check out the insights from Robin Hanson and Michael Anissimov. Think transhumanism is a relatively new social and intellectual phenomenon? Guess again. Many of the ideas characteristic of the movement have already been bantered about for literally hundreds of years—whether it be such things as radical life extension or the construction of machine minds. 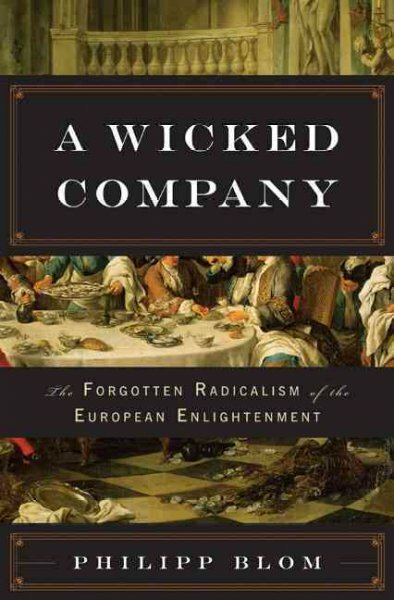 The Enlightenment period in particular was a fruitful time for these ideas to take flight, mostly on account of the new sciences, the rise of rationalism and secular humanism, and the waning influence of religion. Two thinkers that best exemplified Enlightenment-era proto-transhumanism were Denis Diderot and Marquis de Condorcet, and their early contributions are worth revisiting. 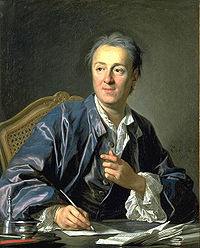 Denis Diderot (1713-1784) was a French philosopher, art critic, and writer. He is probably best known for being the chief editor and contributor to the Encyclopedie, the world's first comprehensive and publically accessible encyclopaedia. But his legacy extends much further than this. Early in his career he speculated about the connection between reason and the senses, and thought that the blind might be able to read through their sense of touch; he is thus considered a forefather of the Braile system. In the same book, "Letter on the Blind," Diderot also rejected a number of religious tenants about nature and the place of man, and quite surprisingly, presented a very early and undeveloped concept about variation and natural selection. Specifically, he argued that organisms were the product of self-generation (what we today would call autonomous processes), and that these animals could change over time—and all without Creation and supernatural intervention. Just as shockingly in terms of insight, he put forward the notion of "thinking matter." He was a materialist in the truest sense, and argued that cognition and consciousness arise from the material realm. Diderot flatly denied the existence of the soul. Needless to say, his ideas got him into serious trouble with the state and he was subsequently imprisoned for some months, often visited by his friend, none other than Jean Jacque Rousseau. Many years later he wrote "D'Alembert's Dream" in which he once again speculated about the ultimate constitution of matter and the meaning of life. In this book he maintained a completely materialistic view of the universe and argued that human behavior was hereditary. It was here where he introduced his theory on life and nature, indicating that matter is not fixed but instead subject to evolution. Each species in existence transforms itself and gives birth to a new species. Diderot also believed that the human species was not immune to this kind of evolution and contended that humanity might end up a society of free individuals just as easily as it could regress to a "single animal." In this sense he was no blind advocate of progress, and warned of potentially Borg-like dystopian futures. He wrote that humanity might eventually be able to redesign itself into a great variety of types “whose future and final organic structure it’s impossible to predict.” In Diderot’s dialogues, d’Alembert muses that human beings could devolve into “large, inert, and immobile sediment.” In other words we could, through accident or intention, lose faculties we value, such as our capacities for empathy, creativity, awe or reflection. Subsequently, argued Diderot, we need guidelines and policies to steer human evolution away from the dead ends of selfishness and addictive absorption, and towards greater sociability, self-awareness and reason. And consistent with his materialism, Diderot also argued that consciousness was a product of brain matter. Consequently, he believed that the conscious mind could be deconstructed and put back together. He felt that science would eventually find a way to bring the dead back to life and redesign animals and machines into intelligent creatures. Truly a man ahead of his time. Marquis de Condorcet (1744-1794) was a hugely influential Enlightenment era thinker who contributed significantly to the rise of secular humanism and helped plant the seeds of transhumanism. He is said to have best represented the ideals of the Enlightenment. 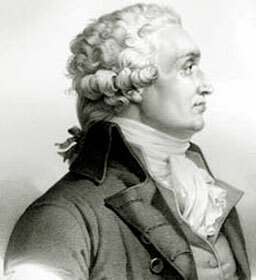 To this end, Condorcet advocated for a liberal economy, free and equal public education, and constitutionalism. He also advocated for the primacy of reason as way to liberate humanity from the church, authoritarianism, and nature. He was a brilliant mathematician and political scientist; he forged the two disciplines together and became the first person in history to effectively use mathematical principles to study social science. Condorcet speculated about utopian possibilities and wrote a piece on the perfectability of society. He gave no concrete definition of a "perfect" human existence, but he believed that the progression of the human race would inevitably continue throughout the course of its existence. 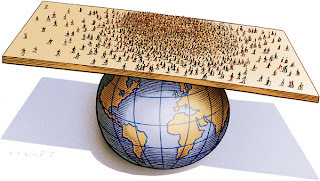 His thoughts prompted Thomas Malthus to write his famous paper on unsustainable population growth. His most influential work from a transhumanist perspective was his book, "Sketch for a Historical Picture of the Progress of the Human Mind", which he wrote when he was in hiding after the French Revolution and subsequently published posthumously. The time will therefore come when the sun will shine only on free men who know no other master but their reason; when tyrants and slaves, priests and their stupid or hypocritical instruments will exist only in works of history and on the stage; and when we shall think of them only to pity their victims and their dupes; to maintain ourselves in a state of vigilance by thinking on their excesses; and to learn how to recognize and so to destroy, by force of reason, the first seeds of tyranny and superstition, should they ever dare to reappear among us. He pin-pointed a number of factors that he believed were responsible for the various inequalities and injustice that inflicted humans—a list that included disparities in wealth, status, education, and of interest to transhumanists—length of life. Indeed, Condorcet was an early advocate of life extension and saw no reason why it shouldn't be a part of humanity's inexorable path towards perfectability. The Enlightenment era was truly a remarkable time and we're still coming to grips with its legacy. Consequently, it's important for many transhumanists to note that we are in fact standing on the shoulders of giants. Not only was their thinking radical, but expressing it was dangerous. Diderot was imprisoned for his writings, an experience, Mr Blom argues, that left him too scared to lay out his philosophy plainly, instead disguising it within numerous plays, novels and letters. Baron d’Holbach published most of his works under pseudonyms, which helped to keep him safe but also condemned him to centuries of philosophical obscurity (except in the officially godless Soviet Union). Even when the French revolution finally came, its self-appointed guardians had no place for the philosophy of the true radicals. For Maximilien Robespierre, chief architect of the reign of terror that followed the revolution, God and religion were far too useful in keeping the population in line. Even today, and even in secular western Europe, the bald and confident atheism and materialism of Diderot and Holbach seems mildly shocking. We still cling stubbornly to the idea of an animating soul, a spiritual ghost in the biological machine. For Mr Blom, the modern, supposedly secular world has merely dressed up the “perverse” morality of Christianity in new and better camouflaged ways. We still hate our bodies, he says, still venerate suffering and distrust pleasure. This is the message of Mr Blom’s book, hinted at but left unstated until the closing chapters. He believes the Enlightenment is incomplete, betrayed by its self-appointed guardians. Despite all the scientific advances of the past two centuries, magical thinking and the cultural inheritance of Christianity remain endemic. Wow, some shockingly apt observations by Mr. Blum. The Enlightenment is indeed incomplete, but we transhumanists are working to correct that. In the quest to map the brain, many scientists have attempted the incredibly daunting task of recording the activity of each neuron. Gero Miesenboeck works backward -- manipulating specific neurons to figure out exactly what they do, through a series of stunning experiments that reengineer the way fruit flies percieve light. Should we say yes to cognition enhancing drugs? Gary Miller's paper in the Journal of Philosophy, Science and Law is worth checking out: Cognition Enhancing Drugs: Just Say Yes? My goal is not, however, to persuade that cognition-enhancement is “good” or “bad” or “moral” or “immoral.” Nor is my goal to advocate policy change. Instead, thinking pragmatically about the ways other unconventional utilitarian initiatives have gained traction, my aim is to persuade academics and policy advocates that if their efforts to prompt change in regard to this issue are ever to succeed, they must first take account of the human cognitive flaws and motivational biases that may well lead a majority of the public to reject such a prospect. I argue that, regardless how miniscule the risks or how blatantly obvious the benefits, a majority of U.S. citizens is unlikely to support the unrestricted dissemination of cognition enhancing drugs, because each individual member of the majority will be led astray by cognitive biases and illusions, as well as logical fallacies. If this premise is accurate, then the people of the United States may already be suffering an opportunity cost that cannot be recouped. While a minority of the U.S. electorate can challenge the constitutionality of a policy enacted by a majority, a minority cannot sue to challenge the legislature’s refusal to enact a specific policy. In other words, we in the minority have no way of claiming we were harmed by what “good” could have come—but did not come—due to the legislature’s inaction. We cannot claim the “opportunity cost to the greater good” as an injury, and we cannot compel a court to balance that opportunity cost of inaction against the individual interests that dissuaded the majority from action. Our only recourse is to compel the majority to change its stance via persuasion. In Part I of this article, I will set out a descriptive account of human morality and rationality in order to explain why advocacy for cognition enhancement is met with moral indignation. Then, in Part II, I will discuss how a better understanding of human cognitive deficits sheds new light on the best strategies for persuading irrationally indignant opponents of utilitarian initiatives. The method of persuasion I will present is a form of moral entrepreneurism modeled on Cass Sunstein’s “libertarian paternalism” and further informed by evolutionary theories of morality, as well as empirical research on legal legitimacy, compliance, and the logic of social reciprocity. Last week, participants in the international Convention on Biological Diversity (CBD) made their views clear at a meeting in Nagoya, Japan. They included in their agreement to protect biodiversity...a moratorium on geo engineering "until there is an adequate scientific basis on which to justify such activities and appropriate consideration of the associated risks". 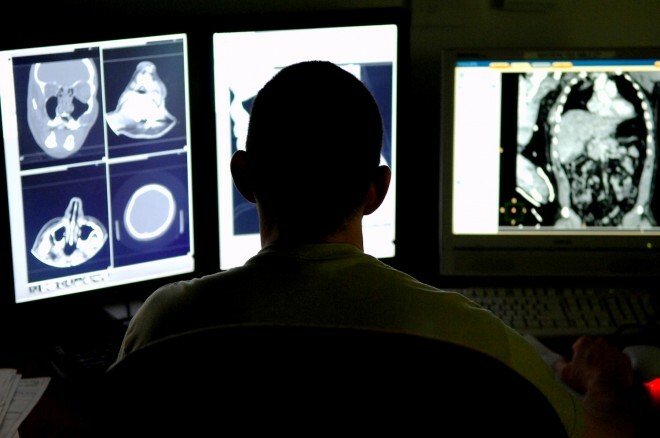 The moratorium, expected to be in force by 2012, isn't legally binding, and given the preliminary nature of studies in the area it is unlikely to affect researchers in the near future. But some scientists fear that the CBD's stance will sow confusion and delay at a time when governments and research groups are exploring how geo engineering might feasibly be undertaken if global warming accelerates disastrously. The CBD agreement coincides with the release of a pair of reports on geoengineering, including a US congressional analysis, published on 29 October, that calls for research across the federal government. In his foreword to the report, Bart Gordon (Democrat, Tennessee), the outgoing chairman of the House Committee on Science and Technology, highlights the dangers of stifling research and calls for a "rigorous and exhaustive examination" of geo­engineering strategies. "If climate change is one of the greatest long-term threats to biological diversity and human welfare," says Gordon, "then failing to understand all of our options is also a threat." His report singles out the US National Nano technology Initiative — a programme that incorporates research at 13 federal agencies — as a possible model for coordinating research. Interface technologies that bridge the gap between the human brain and the internet. In twenty years, our interaction with the web will be so seamless that it will be considered an exosomatic organ. Implications include ubiquitous access to all knowledge stores on the net and "techlepathy. Indeed, it seems that with each passing year we are increasingly closing the gap. As amazing as our computers and hand-held devices are today, I already consider them clunky and even anachronistic relative to what I see coming down the pipes. As it stands, if I want to communicate with somebody or look something up, I have to go to my computer, launch a web browser, do a search, blah, blah, blah. It's tedious and boring—but most of all it's a waste of time. In the future I'm imagining, this gap—the delay between needing something on the internet and actually getting it—as being seamless. Such a development will be the result of ongoing miniaturization of technologies, ubiquitous computing and more sophisticated interface devices, namely language user interfaces (LUI's) and even neural user interfaces (NUI's). And once we're at the NUI phase we will have accomplished a rather remarkable thing: The unimpeded connection of the brain with the internet. At this stage, we will be able to navigate the Web and communicate with others through our subvocal commands and even our thoughts alone. When this happens, the internet will become less an external resource than an exosomatic organ. It'll be like an extension of our brain. The internet is already very much like this, but as mentioned, the process of interacting with it is still rather primitive. Once we can access the Web in such an on-demand fashion, the speed with which we can access data and communicate with others will likely result in giant leap in terms of human capacities and performance. I suspect that collective IQs will rise dramatically, collaborative efforts will increase in scale and potency, and social networking will evolve to a new level. This might even usher in the much speculated age of the global mind in which we will have ubiquitous access to a chorus of friends, thinkers, and specialized groups. A concern about all of this is that, given such a possibility, we will still be working with our limited paleolithic brains. It's an open question as to whether or not our minds will be able to handle all this busyness. I suspect that, in order to make sense of it all, we will have to employ sophisticated filtering, automated workflows, virtual agents, and ongoing data analytics. And this is before we get involved with actual cognitive enhancement—so there is hope. Be sure to read the rest of the I Look Forward To article in which other futurists are interviewed, including David Pearce, Michael Anissimov, Phil Bowermaster, and Aaron Saenz. The quantified self movement is really starting to gain some steam, mostly on account of a slew of new technologies and services that are making personalized metrics easier and more meaningful. It's truly a case where the dream is coming true; in short order we will be able to track the most minute details of our body's functioning, have that data analyzed, and given a set of prescriptions to help us optimize our health based on a predetermined set of goals. We're not totally there yet, but that day is quickly approaching. Imagine a system that can tell you your Omega 6 to Omega 3 ratio and what you need to do to get it in balance. It could let you know when your iron levels are too low. Or if your LDL cholesterol is too high and what you need to do to raise your HDL levels. A fully realized system will notify you of any problem and let you know what to do about it. When it comes to our health concerns, there will be no more fumbling in the dark. But there's more to the quantified self movement than just tracking health factors: it's also about self-experimentation. People are looking to better understand their own bodies and behavior. This kind of self-evaluation can be as straight-forward as assessing your performance on or off caffeine, or something more profound like measuring the potential cognitive boosting effects of modafinil. With this empirical approach, the sky's the limit in terms of possibilities. Google Health is an online central repository for you to store and share your medical data with whomever you want. You can act on all your health and wellness concerns, engage in data tracking, increase personalization and set and track progress toward health goals. It features an easy-to-use dashboard that brings together your health and wellness information in one place and makes it easier for you to organize and act on that information. Participants can track wellness and wellness goals, including the recording of daily experiences. Despite some recent setbacks, the personalized genomics movement is steadily gaining in popularity. Companies like 23andMe are empowering individuals with the genetic information they need to better understand who they are and their potential health trajectory. For less than $500, you can learn about your genetic traits, vulnerabilities to inherited diseases, and even ancestry. Armed with this information, you can more knowingly set up preventive health programs for yourself and avoid potential problems later in life. CureTogether provides free tools to help you track your sleep, weight, caloric intake, and exercise. You can also compare your symptoms and treatments for 212 conditions with the community of CureTogether members. In addition, anonymous, free, aggregate data is used for open source health research. BodyMedia recently announced that its armband sensors will be able to communicate wirelessly with smartphones via Bluetooth. Its health sensors will be one of the first devices, other than ear buds, that link to smartphones with Bluetooth short-range communications. The device is poised to allows users to monitor a collection of nearly 9,000 variables—physical activity, calories burned, body heat, sleep efficiency and others—collected by the sensors in a BodyMedia armband in real-time, as the day goes by. The Bluetooth-enabled armband will cost $249 and the BodyMedia data service will cost $7 a month. Zeo is a program that is designed to help you analyze your sleep and improve it. It’s composed of a lightweight wireless headband, a bedside display, a set of online analytical tools, and an email-based personalized coaching program. It works accordingly to a three step process in which you sleep with the wireless headband, view the data that's recorded, and act on tips and assessments received through email-based coaching. The Fitbit is a wearable device that tracks your calories burned, steps taken, distance traveled and sleep quality. It contains a 3D motion sensor like the one found in the Nintendo Wii. The Fitbit tracks your motion in three dimensions and converts this into useful information about your daily activities. The device can be worn on your waist, in your pocket or on undergarments. At night, you can wear the Fitbit clipped to the included wristband in order to track your sleep. Anytime you walk by the included wireless base station, data from your Fitbit is silently uploaded in the background to Fitbit.com. So, what are you waiting for? Go quantify yourself! 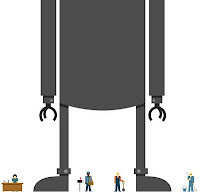 ...a leading explanation for the disappearance of the middle class is "ongoing automation and off-shoring of middle-skilled 'routine' tasks that were formerly performed primarily by workers with moderate education (a high school diploma but less than a four-year college degree)." Routine tasks, he explains, are ones that "can be carried out successfully by either a computer executing a program or, alternatively, by a comparatively less-educated worker in a developing country." The culprit, in other words, is technology. The hard truth-and you don't see it addressed in news reports-is that the middle class is disappearing in large part because technology is rendering middle-class skills obsolete. People say America doesn't make anything anymore, but that's not true. With the exception of a few short lapses, manufacturing output has been on the rise since the 1980s. What is true is that industrial robots have been carrying ever more of the manufacturing burden on their steely shoulders since they appeared in the 1950s. Today, a Japanese company called Fanuc, Ltd., has industrial robots making other industrial robots in a "lights out" factory. (That's the somewhat unsettling term for a fully automated production facility where you don't need lights because you don't need humans.) That's where we're headed. It's not just manufacturing, either. 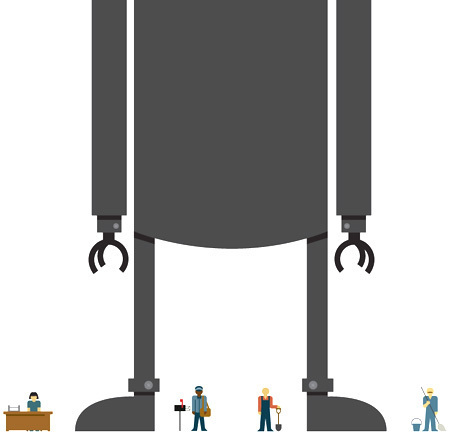 Automated call centers are replacing customer-service agents. Automated checkout stations are replacing grocery-store clerks. When the science of computer vision advances sufficiently, we'll have algorithms, not humans, evaluating X-rays at airport security checkpoints and screening user-generated content for sites like Facebook. I've always suspected that the Baby Boomer generation will not go down quietly. While the Me Generation is currently content to maintain the status quo as it pertains to the treatment of the elderly, I strongly believe that they will eventually rail against traditional practices once they get there themselves. Echoing this sentiment is Ted. C. Fishman who, in his new book, Shock of Gray, makes the case that people's increasing life spans could change everything from civil rights to globalization. He also addresses the potential for radically extended lifespans. As baby boomers start to approach the age of 65 in large numbers, do you foresee a civil rights movement for older adults, given that generation's history of activism? There might be a civil rights movement, but people won't recognize it as a civil rights movement. They'll see it as an economic turf war. When you get the resources of a society, you get the respect. You can see this in Europe right now, where the population is somewhat older than it is here. The debt crisis has really caused a huge and quick reckoning with the crisis in pension funding and hundreds of thousands of people are coming into the street. They made promises to themselves and now they find that they can't keep those promises. In some ways, they're battling their past selves. But they feel like they are fighting a younger generation. Yeah, I think that's right. But in the long run the battle will not be for who gets what share of the public financing. It will be a more traditional civil rights issue, which is: Evaluate me on my abilities and my skills, not on my weaknesses. The older population is a hugely diverse one. If the image of an older person is going to be exclusively that of an enabled, sharp, cognitively with-it, older person who can work into their 70s and 80s, then we're ignoring a huge part of the population that will need our help. Well, that brings us to the primary tension of the book. On the one hand, we humans have become very effective at prolonging life. On the other hand, these prolonged lives are placing pressures on our resources that will become critical. So the question is, which should win, our prolonged lives or the resources? I think the hands-down winner there is longer life. Especially longer, healthier life. So if you add up all the misgivings we have about a society that has far more older people and the challenges of age and ageism, they don't even compare to the gift of living longer and living healthier. This is what humankind has been devoted to since we could first mix a few herbs together. And we're there. So our challenge is to apply this kind of brilliance to the result that we've created, which is being an older society. Our life span averages have leaped in the past century, as you point out, and I wonder if you think there's a point where we'll hit a ceiling. Now that you've read the science, is there really a possibility for immortality? I only read the science as a layman and I can only tell you who I trust, which is based on emotional signals as much as empirical ones. I do think maybe eventually we'll be able to reengineer the human body so that it's some mix of mechanization and biological miracle and we live forever. But in the lifetime of anybody who's reading the book, I think there are big limits to the expansion of the human life span. Our genetic makeup is such that the genes that help us grow when we're young tend to turn against us as we get old. Wired is reporting how last month the Air Force Research Laboratory’s 711th Human Performance Wing revamped a call for research proposals examining "Advances in Bioscience for Airmen Performance." It’s a six-year, $49 million effort to deploy extreme neuroscience and biotechnology in the service of warfare. Among their suggestions is the use of "external stimulant technology to enable the airman to maintain focus on aerospace tasks and to receive and process greater amounts of operationally relevant information." ...perhaps the oddest, and most disturbing, of the program’s many suggested directions is the one that notes: “Conversely, the chemical pathway area could include methods to degrade enemy performance and artificially overwhelm enemy cognitive capabilities.” That’s right: the Air Force wants a way to fry foes’ minds — or at least make ‘em a little dumber. Can science investigate the supernatural? Good discussion going on about whether or not science can investigate the supernatural. Of course, science cannot investigate the supernatural if we define "the supernatural" as "whatever cannot be investigated by science"! But once we define the supernatural in some other plausible way it is by no means apparent that science can't investigate it, just as it can investigate things that no longer exist (such as dinosaurs), things that are very distant (such as the moons of Jupiter), and things that are very small (such as atomic nuclei). None of the latter can be perceived directly with our senses, but they can interact with our senses in other ways - by leaving traces on the world that we can perceive, by interacting with scientific instruments to create images that we can perceive, by affecting experimental apparatus in predictable ways, and so on. In the end, we can use distinctively scientific means to investigate many things that interact with our senses only indirectly. Depending on the situtation, we can sometimes establish a lot about those things. We do, in fact, know a lot about the moons of Jupiter, dinosaurs, and atomic nuclei, even though none of these things have ever been directly observed with our senses (the moons of Jupiter have been observed via scientific instruments such as telescopes, and we have various reasons to think that these are reliable, but they have not been observed by unaugmented human eyes). At issue is the oldish question of whether science can probe into "supernatural" questions, the most famous of which is "Does God exist?" Traditionally, the question hangs on the distinction between two kinds of naturalism: methodological naturalism, which excludes supernatural phenomena as out-of-scope, (whether or not they actually exist), and philosophical naturalism, which assumes a priori that supernatural phenomena do not exist. A number of scientists and philosophers are dissatisfied with these two options, since neither seems to permit the testing of the "God Hypothesis." The solution to this that both Russell and Jerry point to is presented in a new paper in Foundations of Science which proposes to further split Methodolological Naturalism into two more categories: Intrinsic Methodolological Naturalism (IMN) and Provisional Methodolological Naturalism (PMN). IMN is the old way of doing things; PMN the new, improved way, allowing for scientific study of supernatural phenomena, should they happen to pop up unexpectedly in the course of our research. Nowhere do the authors of the paper define just what supernaturalism is supposed to mean. The word is commonly used to indicate that which is not subject to "natural" law, that which is intrinsically concealed from our view, which is not orderly and regular, or otherwise not amenable to observation and quantification. That right there should be a conversation-stopper, since these are science's stock and trade, and we've seemed to stumble on a simple logical end to the problem. Also check out contributions to this discussion by Jerry Coyne, John Pieret, and Massimo Pigliucci and the Cosmic Variance blog. And of course the article that started it all, the paper by Maarten Boudry, Stefaan Blancke, and Johan Braeckman.